On March 24, 1946 the Cabinet Mission comprising three Cabinet Ministers arrived at Delhi and presented the Partition Plan of India on May 16, 1946. Jinnah was keen to make Baluchistan a part and parcel of Pakistan. Conversely, the people who were averse to the prospect of the Indian Muslims securing an independent homeland - Nehru and Mountbatten, for instance - created all types of difficulties for the Muslim League. The British June 3rd Plan, had allowed the Indian States to free-wheel to accede either of the two dominions, or even to remain independent on the lapse of British paramountcy. The Khan of Kalat claimed that Kalat was an independent state and no decision should be made about its future without consulting the Khan. His forebears had been the equals of the Amirs of Kabul, or the King of Nepal. The Khan sent a formal letter to Mr J Colville (Crown Reprer.entative/Governor of Bombay) asserting his claim of a sovereign independent state status under the Treaty of 1876, which allowed an appointed representative from Kalat in Delhi. This was a protocal not accorded to other Indian princes. He substantiated his arguments by drawing parallels with the King of Nepal who had an independent status, diplomatic privileges and immunities granted by the HMG. The Khan also pointed out that he had never sent his representative to the Chamber of Princes on the grounds that he had never consented to be an Indian Prince. He considered himself to be like the Kings of Afghanistan, Iran and Nepal. However, his boycot of the Chambers of Princes had not prejudiced his relationship with the HMG. A comparative study of the various treaties between the HMG and Kalat as well as those between the HMG and Nepal and other Indian States would show that the Khan's plea had a certain measure of legal and historical validity. Both the Viceroy, and Nehru, disagreed with the Khan's contentions. The Khan (Beglar Begi Mir Sir Ahmad Yar Khan) declared the independence of Kalat, but offered to negotiate a special relationship with Pakistan. Other Baluchi chiefs (sardars) also expressed their preference for a separate identity [some sources report that the Khan declared independence two days before Pakistan declaration of statehood, other say it came on August 5, 1947, a day after the independence of Pakistan]. Kalat was the last state to accede to Pakistan. After the British left Balochistan on 13 August 1947, the Khan declared to join Pakistan. The central government sent the Pakistan army, who forced Mir Ahmed Yar Khan to give up his state. Mir Ahmed Yar Khan signed an accession agreement ending Kalat's de facto independence. Finally the Khan of Kalat Mir Ahmed Yar Khan acceded unconditionally, and the Instrument of Accession was signed on 27 March 1948. However, protests broke out and people demanded internal political sovereignty. The refusal to grant autonomy to Balochistan and the continued existence of the Sandeman system resulted in civil unrest. 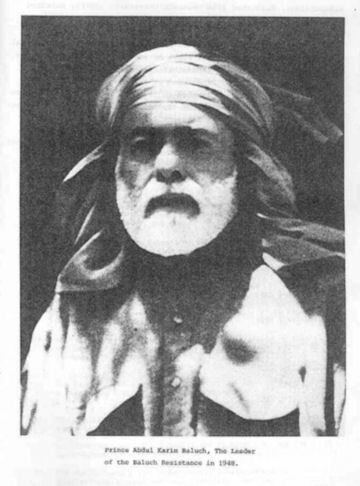 After the ratification of accession documents on 31 March 1948, Shazada (Prince) Abdul Karim, younger brother of the Khan of Kalat unfurled the standard of rebellion against Pakistan. Abdul Karim Baloch, the youngest son of Nawab Bahadur Mir Mohammad Azam Jan Khan, was educated in Karachi and served as the governor of Makran province until March 1948. Also known as Prince Abdul Karim Khan, he was the younger brother of Khan of Kalat, Mir Ahmad Yar Khan, the last ruler of Balochistan. On the night of 16th May 1948, Prince Abdul Karim Khan, decided to lead a separatist movement against the Pakistan government. The prince asked help from Afghanistan, Iran and Soviet Union (Russia), but did not receive a positive and prompt response. The Prince invited the leading members of Baloch nationalist political parties; the Kalat State National Party, the Baloch League, and the Baloch National Workers Party, to join him in the struggle for the creation of an independent "Greater Balochistan." Apart from his political motives, the Prince was a member of the royal family and the former governor of the Makran province; he was upset by Pakistan's recognition of Sardar Bay Khan Gichki as Makran's ruler. With a Lashkar (Tribal Force) of about 500 persons Prince Abdul Karim Khan crossed the border and set up a camp about eight miles inside Afghanistan at Saarlat opposite Mastung. Prince Abdul Karim Khan, decided to carry on with the struggle. Basing himself in Afghanistan he conducted guerrilla warfare against the Pakistan army. However, he failed in recruiting a tribal army in Afghanistan or securing King Zahir Shah's support for his anti-Pakistan activities. The Prince was forced to return to the Khanate and negotiate for his demands peacefully. On 08 July 1948, when the news of the Prince's arrival reached Kalat, the Prime Minister and a Kalat State Force went to meet the Prince at Earboi to deliver the Khan's message. With Afghan aid, Abdul Karim entered Balochistan and organised a rebellion against Pakistan in the Jhalawan area. He received assistance from Mir Gohar Khan Zehri, an influential tribal leader of the Zarkzai clan. Major General Akbar Khan, who was in charge of the Pakistani army's Seventh Regiment, was ordered to attack the insurgents and force them to surrender. Prince Karim and his 142 followers were arrested and imprisoned in the Mach and Quetta jails. After the arrest of the Prince and his party, the Attorney Governor General gave an order for an inquiry, to be conducted by Khan Sahib Abdullah Khan, the Additional District Magistrate of Quetta. He submitted his report on 12th September 1948. His report was based on the Prince's activities and upon the letters and documents published by the separatist force. After the inquiry, R. K. Saker, the District Magistrate of Quetta, appointed a special Jirga (official council of elders of the same and surrounding tribes). This Jirga was instructed to study the circumstances and events which led to the revolt and was asked to give its recommendations to the District Magistrate. On 10 November 1948, the Jirga heard the testimony of the accused and gave its recommendations to the District Magistrate. on 17 November 1948, suggesting the delivery of the Prince to Loralai at the pleasure of the Government of Pakistan and various other penalties. The District Magistrate, in his order dated 27 November 1948, differed with the opinion of the Jirga and sentenced the Prince to ten years of rigorous imprisonment and a fine of 5000 rupees. Other members of his party were given various sentences and fines. Prince Abdul Karim Khan founded Ustman Gal (People's Party) and took part in the formation of the National Awami Party, he worked as the head of the branch of the 'Sindhi, Baloch and Pakhtun front in Balochistan and died in 1986 [reports that he was killed in clashes with the army along with many of his supporters are without foundation].